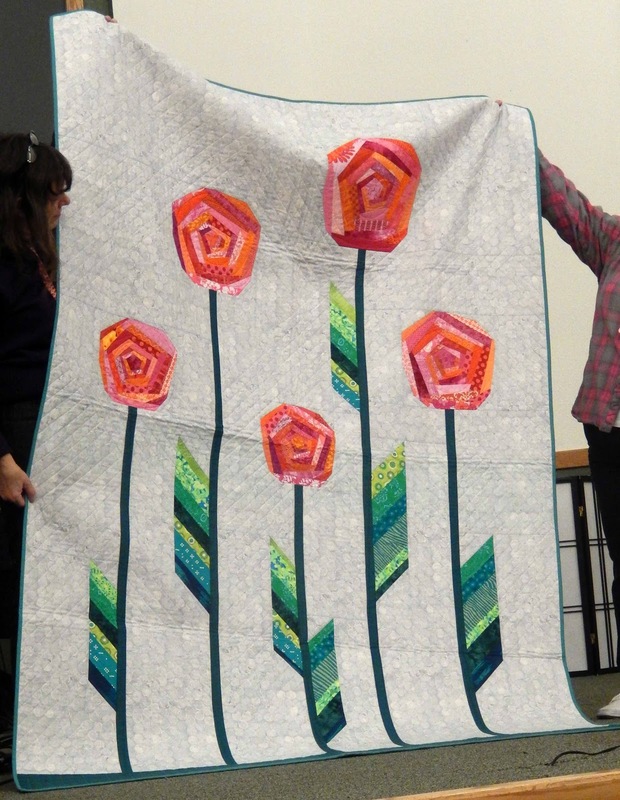 Westside Quilters Guild: Highlights of the January Meeting. 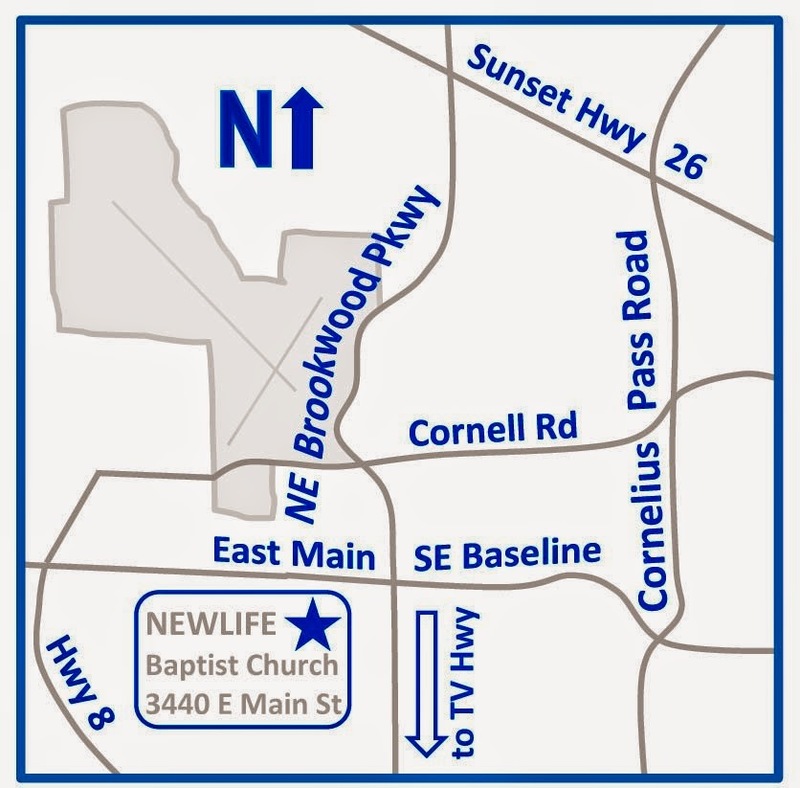 Highlights of the January Meeting. 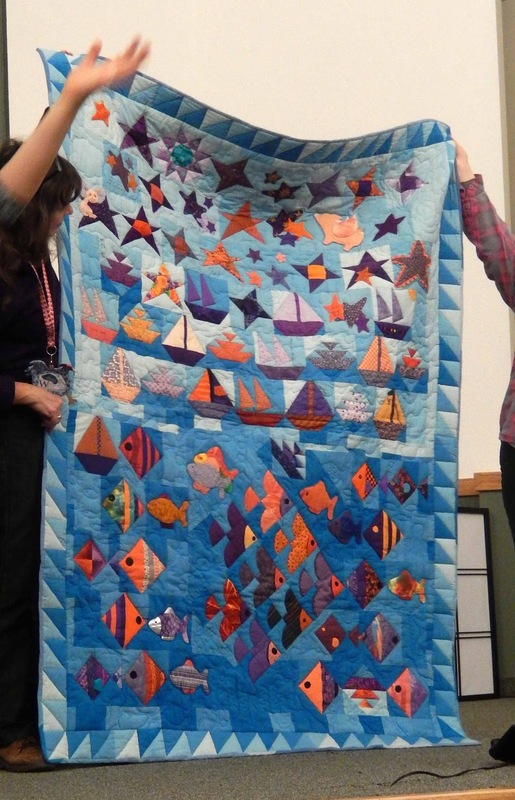 At January's meeting, guild members were treated to a trunk show from Sam Hunter. You can see Sam's web page, Hunter's Design Studio right here. 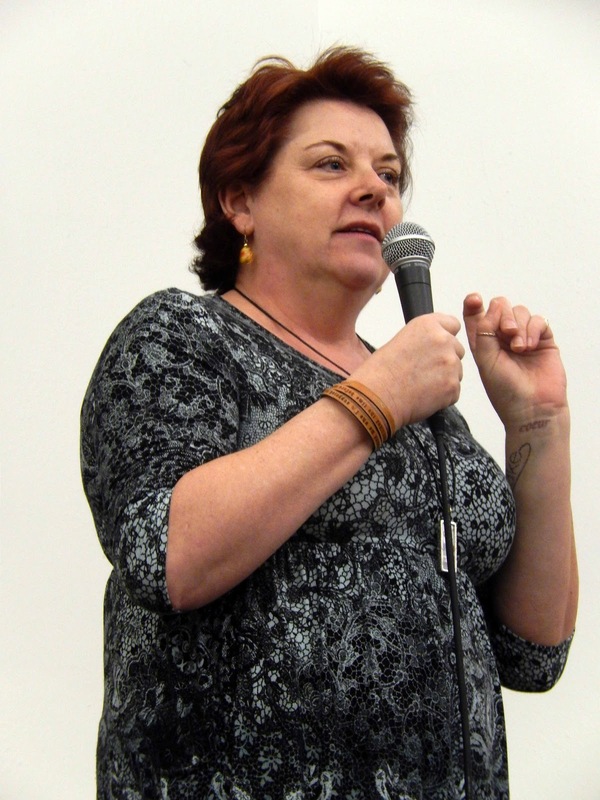 Sam was an entertaining speaker. She self-describes as "sassy" and it certainly came through in the hour-long talk she gave last night. 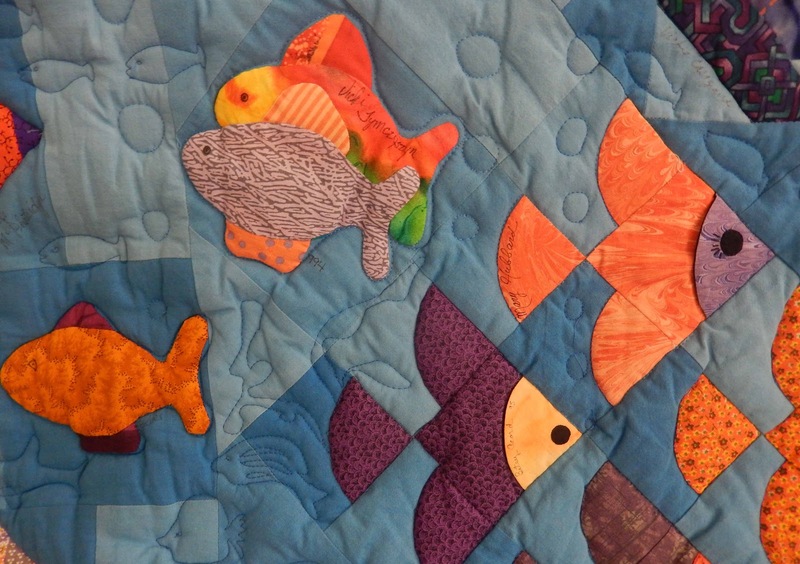 Her quilts were lovely and creative. 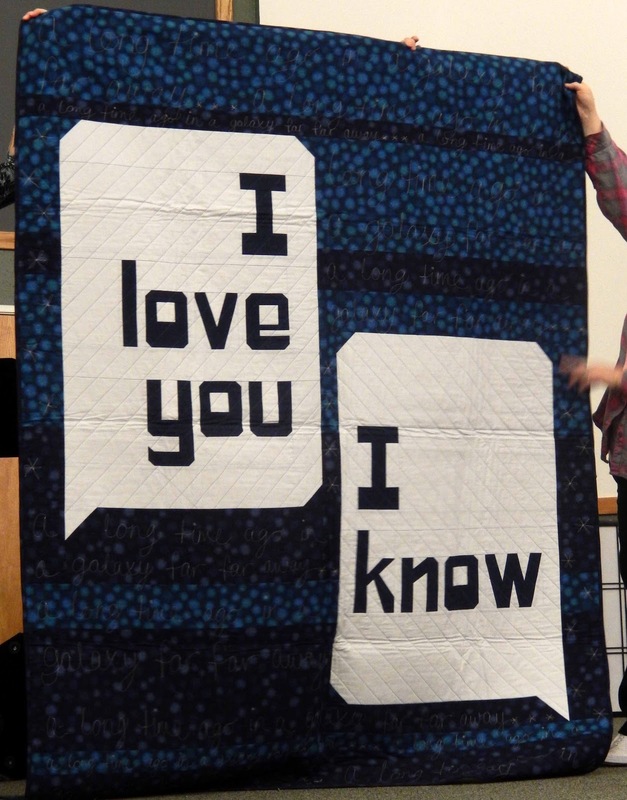 In fact, she says this is the first quilt she ever made. That's a big Wow! 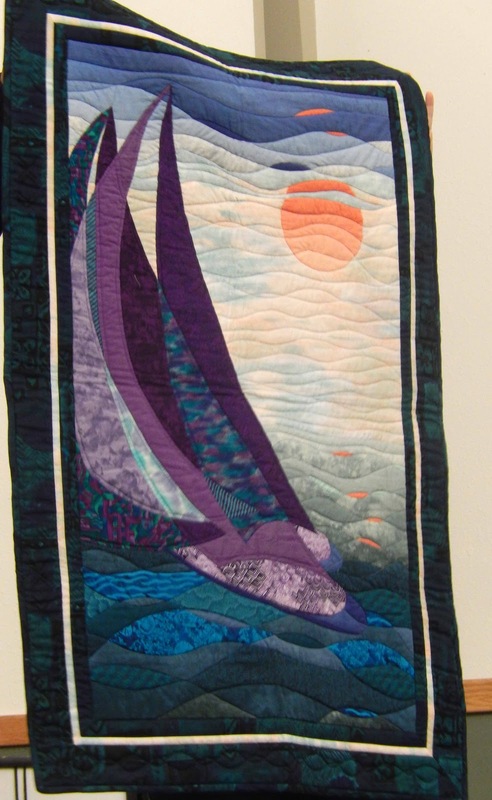 She creates her own hand-dyes and bemoaned the quilt below, saying that she'd entered it in a show only to have it hung in bright sunshine, which faded the colors. 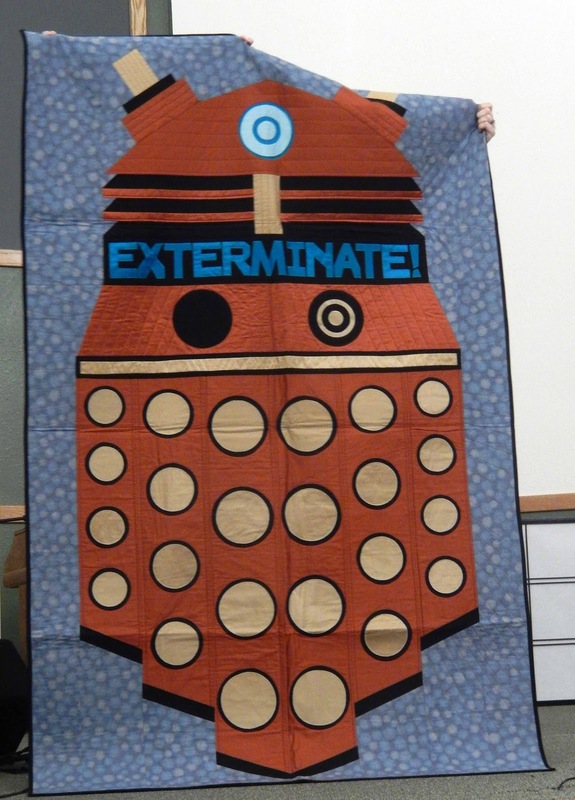 Still, it's a lovely quilt. 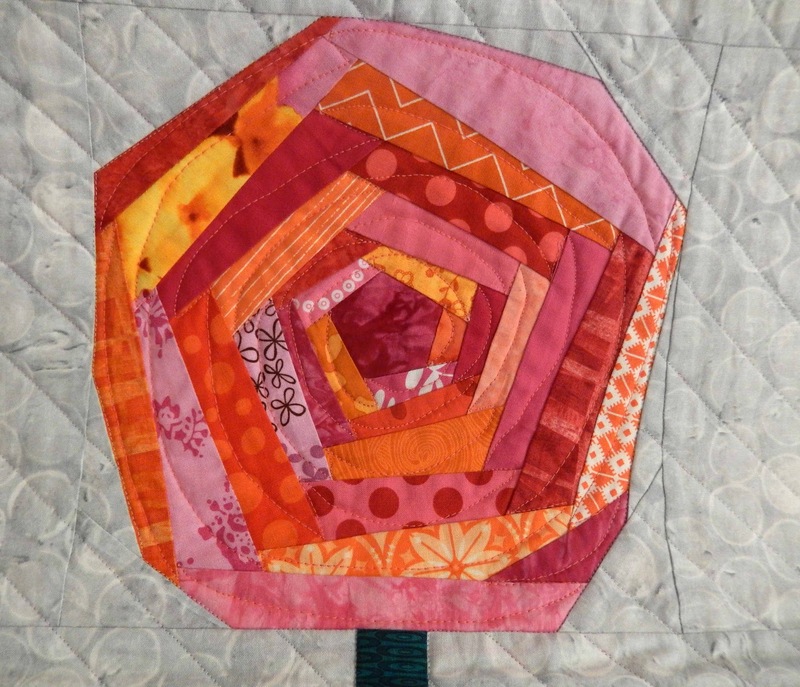 Having quilted for some years on a strict budget, she's made an art of using scraps, precuts, and endeavoring to use all the fabrics in her stash. 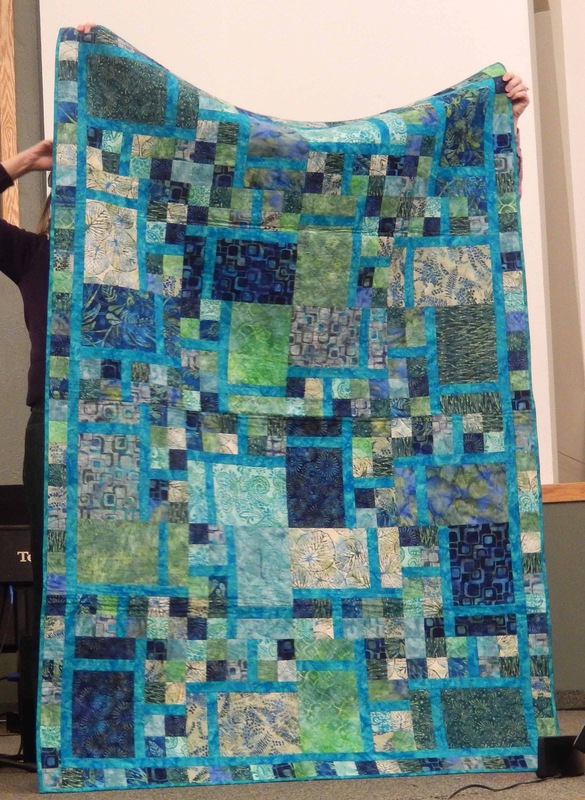 When she learned to make the pickle dish design, she was so excited by it that she created some hand dyed fabric to match for the remainder of the quilt. Her backs are often pieced in bright and whimsical colors, and she explains this practice came out of her "budget" years. 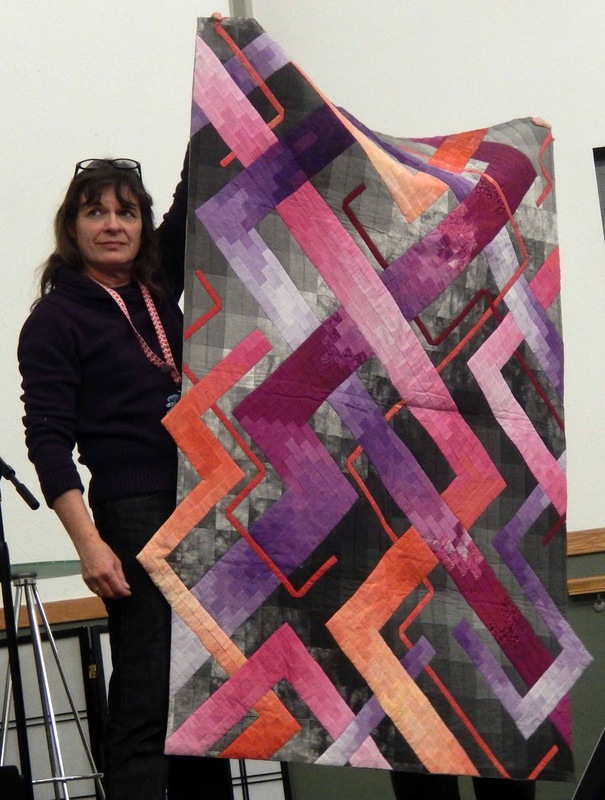 This quilt is one of the first patterns she created. 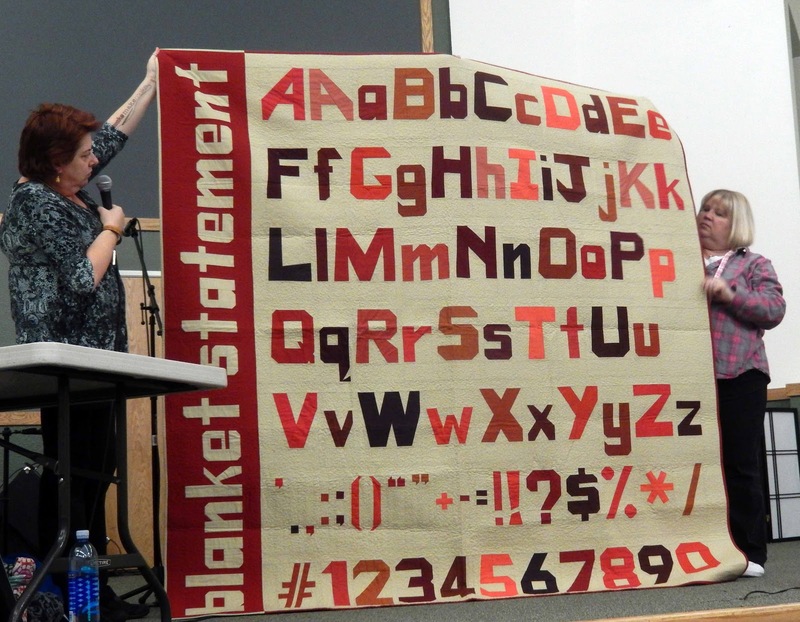 And she claims the quilt below can be made with none of the dreaded "Y" seams. 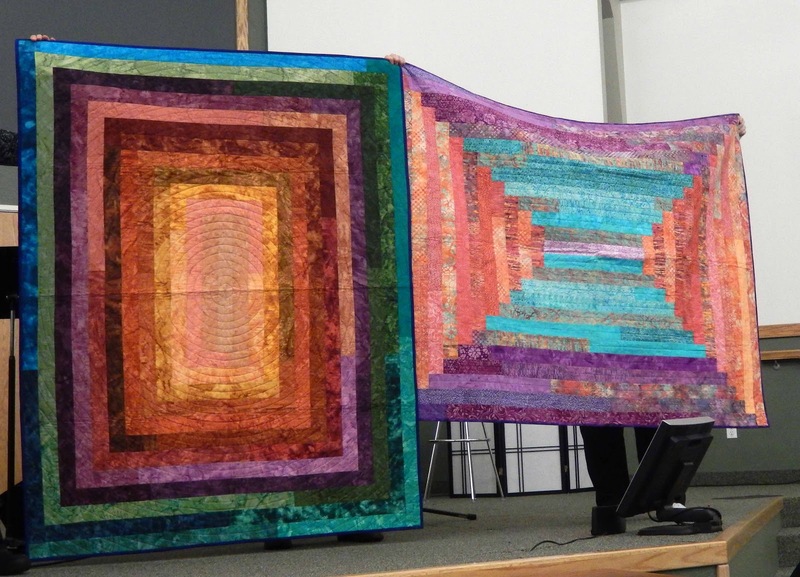 The quilts below are different layouts using jelly rolls. And here's a nice scrappy version with the little dark detailing to add interest. 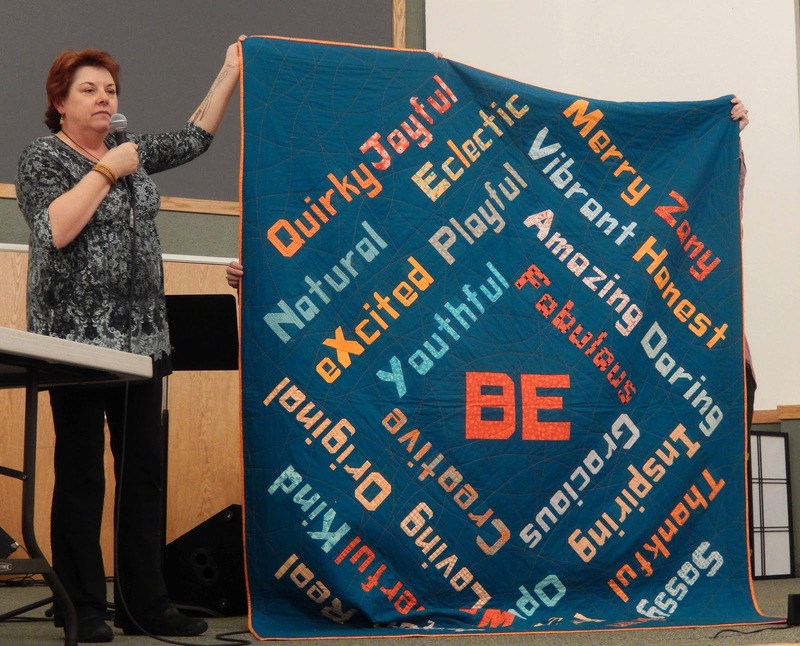 When she made this quilt, she thought it needed something to make it a little more interesting. 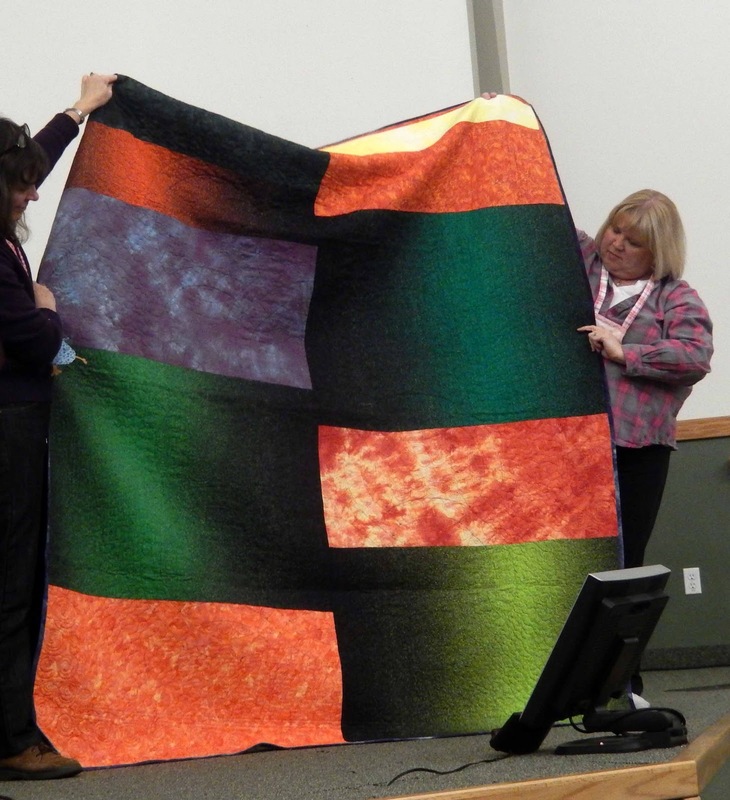 And so she made the same quilt, adding the little squares on the top and the bottom to give it some spark. 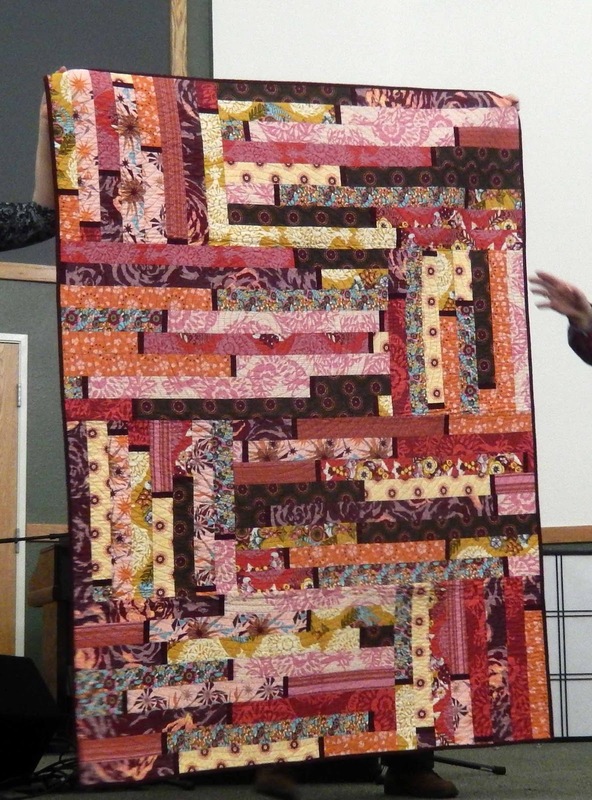 Her patterns feature her "Fabulous Fourteen" designs that can be made from fourteen fat quarters. 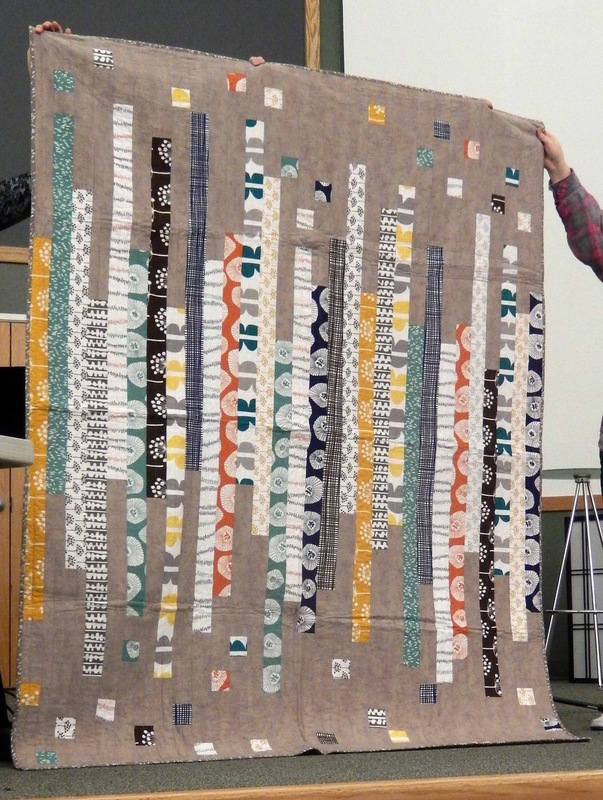 In her quest to use all the fabric from a particular project, she uses the cut-off ends from blocks to create the two patches in the border. 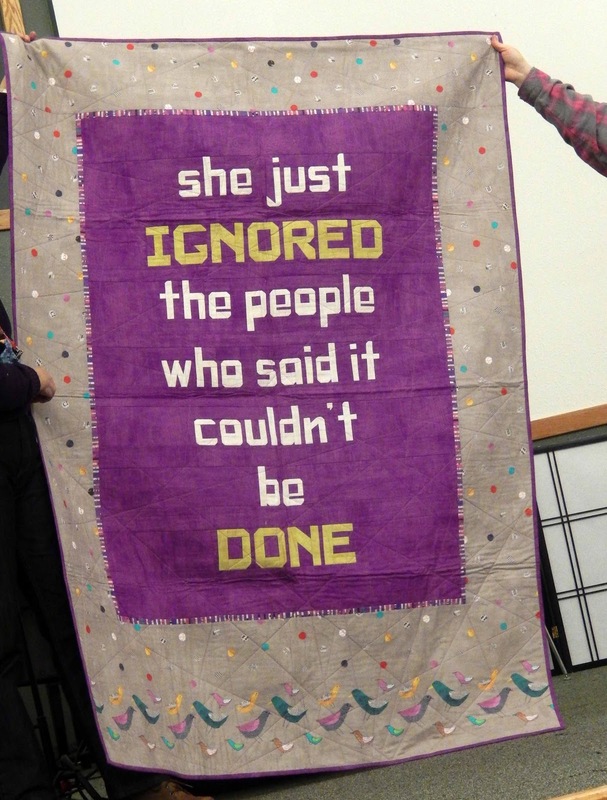 She didn't make the next quilt. 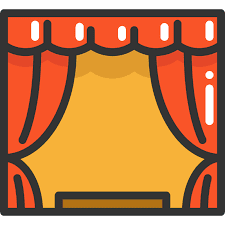 Rather, her guild created it for her when she left. 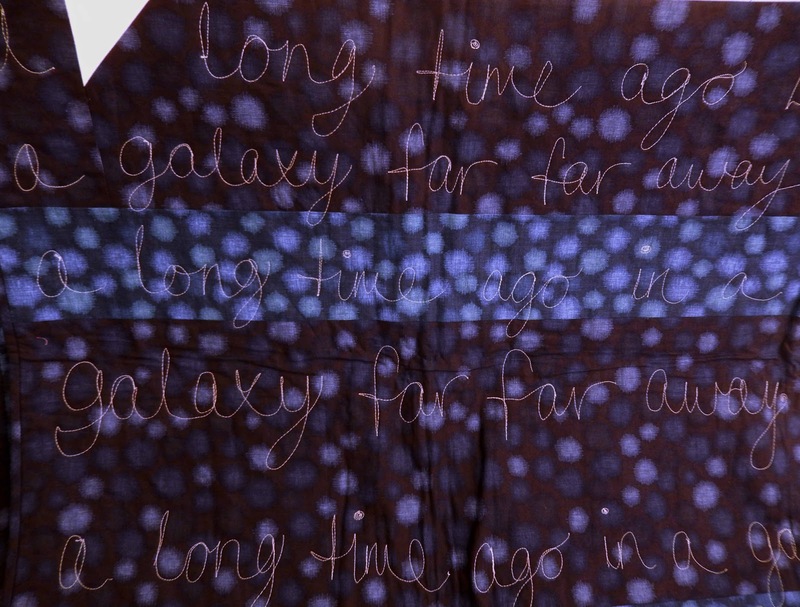 They used her own hand-dyed blues for the background. Here's some detail that shows that the blocks are signature blocks. 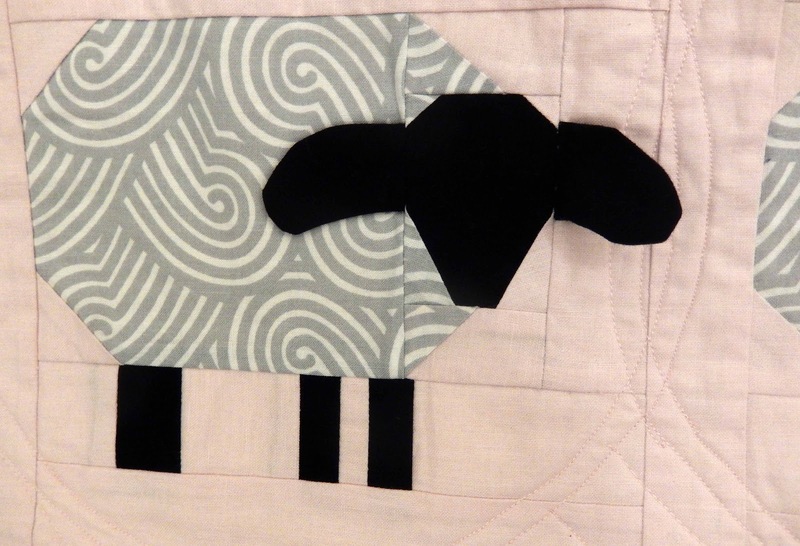 Clever quilting too! Dr. Who fans will appreciate the next one. 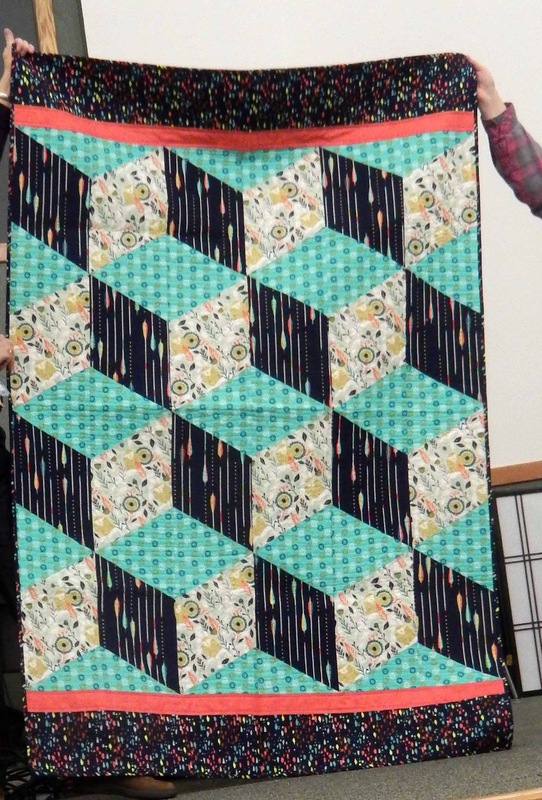 The next quilt is paper-pieced, and she had this pattern for sale at our meeting. 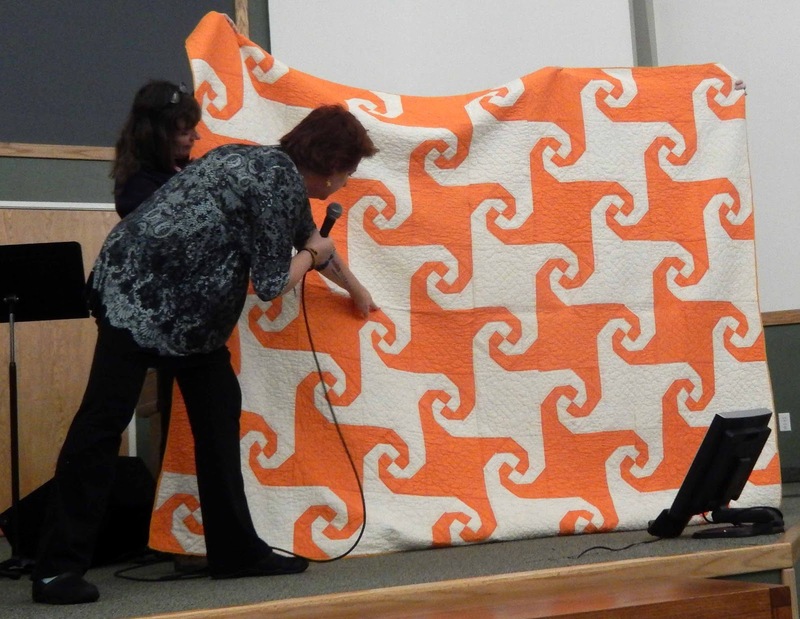 In fact, there were patterns for many of the quilts seen here. Here's a detail of the flower. 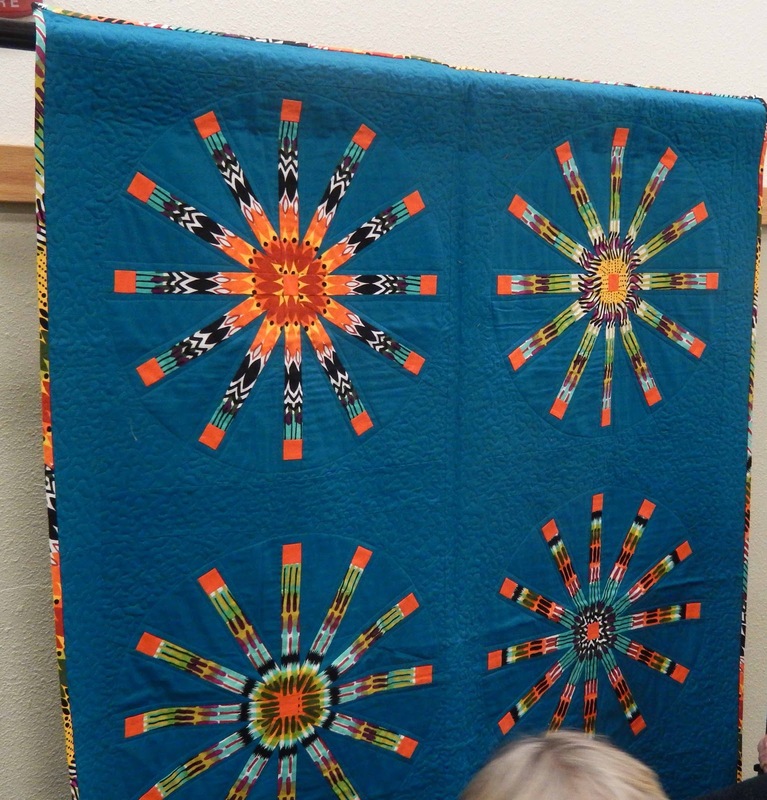 Sam showed us her only "vintage" quilt. 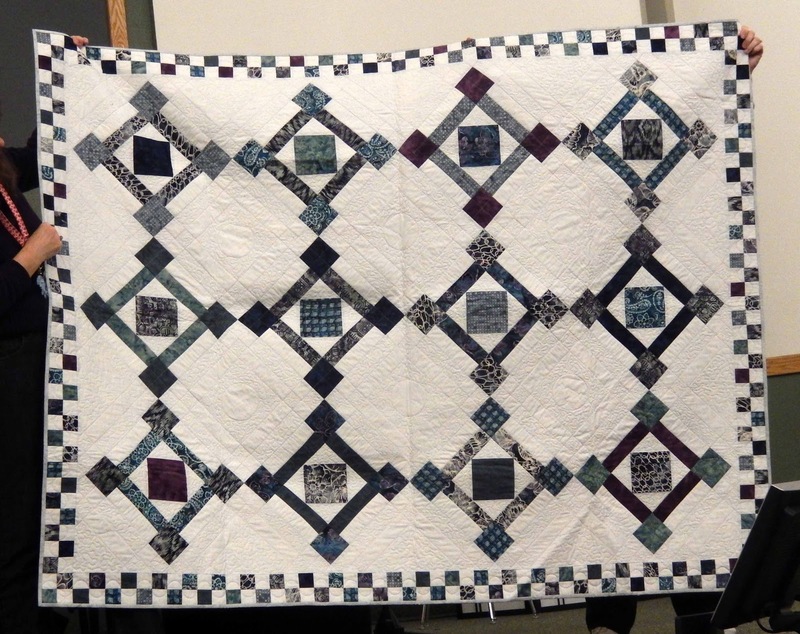 This quilt was hand-pieced and hand-quilted, although she purchased it without knowing any more about it or the quilter. 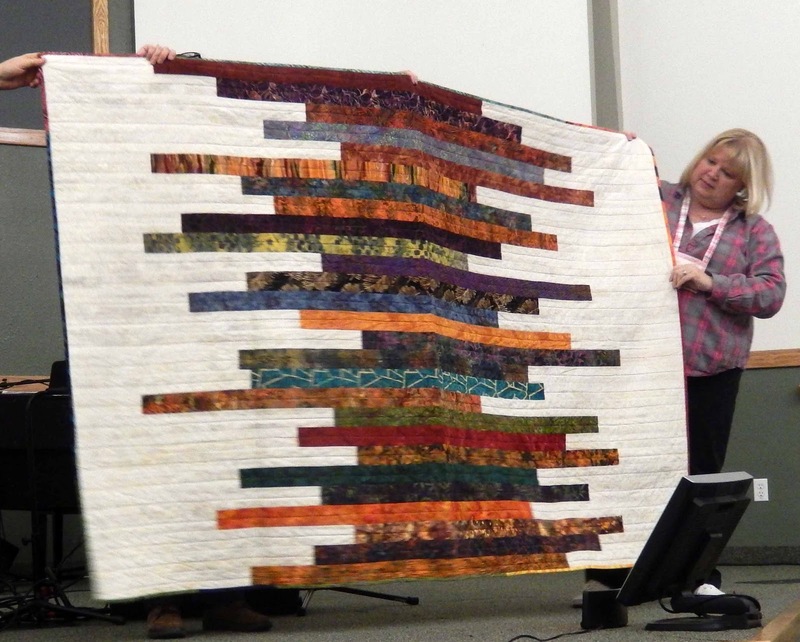 She paused her to spend some time talking about imperfections in our sewing and claims to "love every imperfection" in all of her quilts. 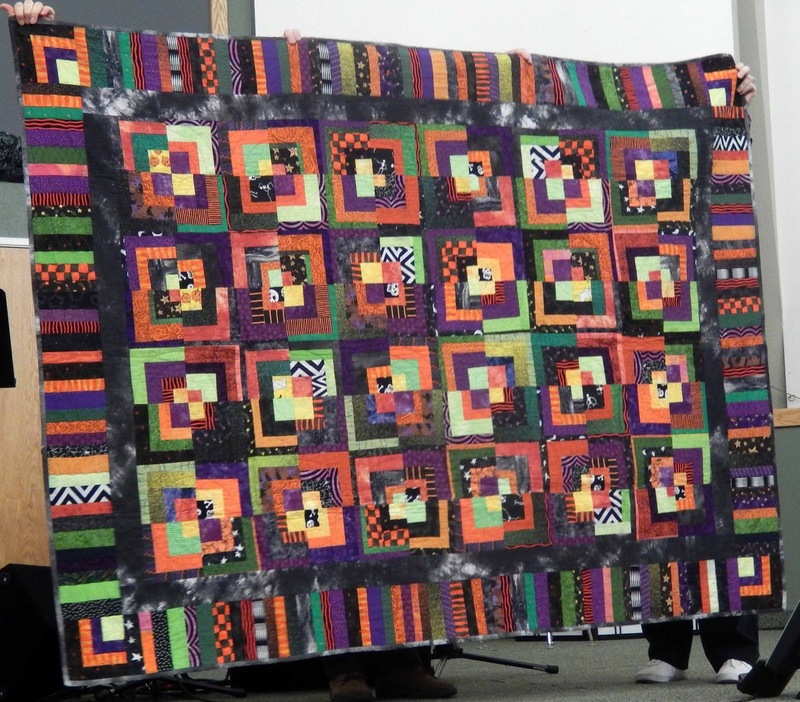 She says that a hand-made quilt should show the hand of the quilter in its imperfections. 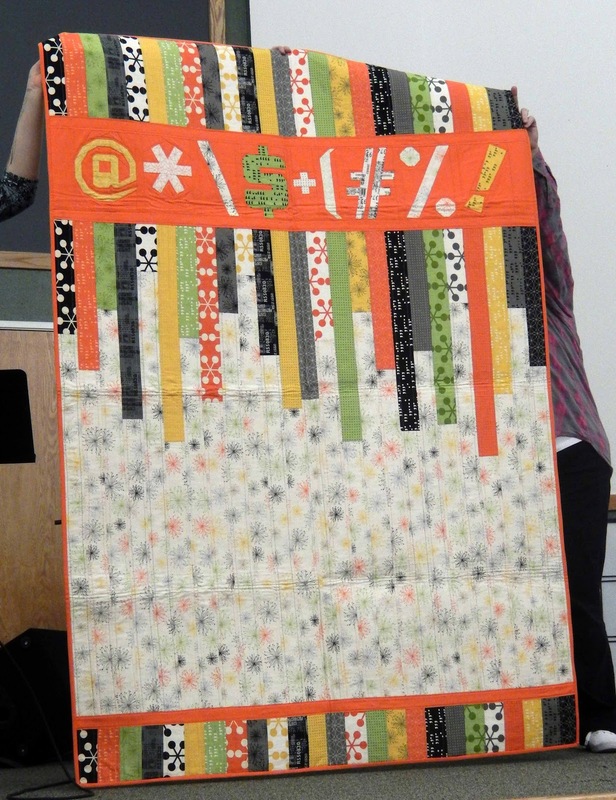 Her book Quilt Talk (link right here) features the paper-pieced quilting alphabet she developed. It includes all the upper and lower case letters of the alphabet along with numbers and popular symbols. 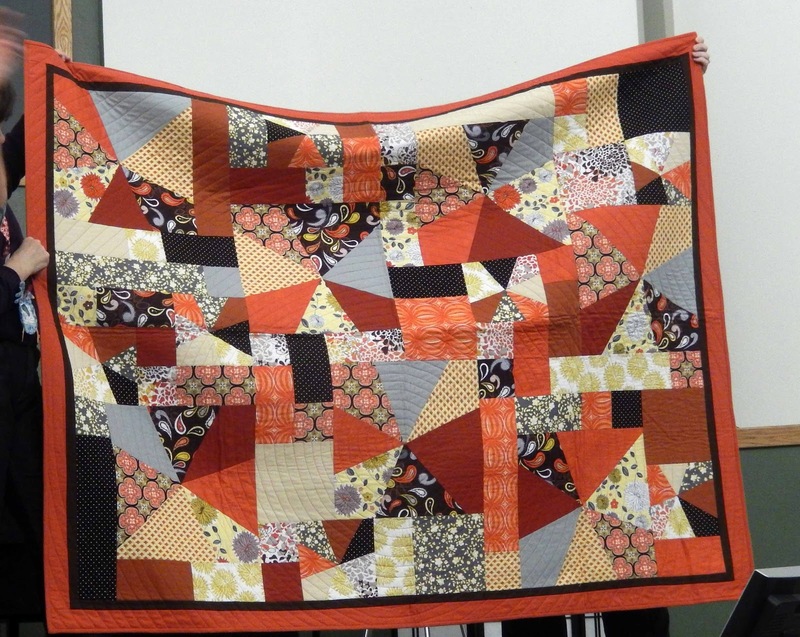 These can be resized for use in any quilt. The lambs' ears are three-dimensional. 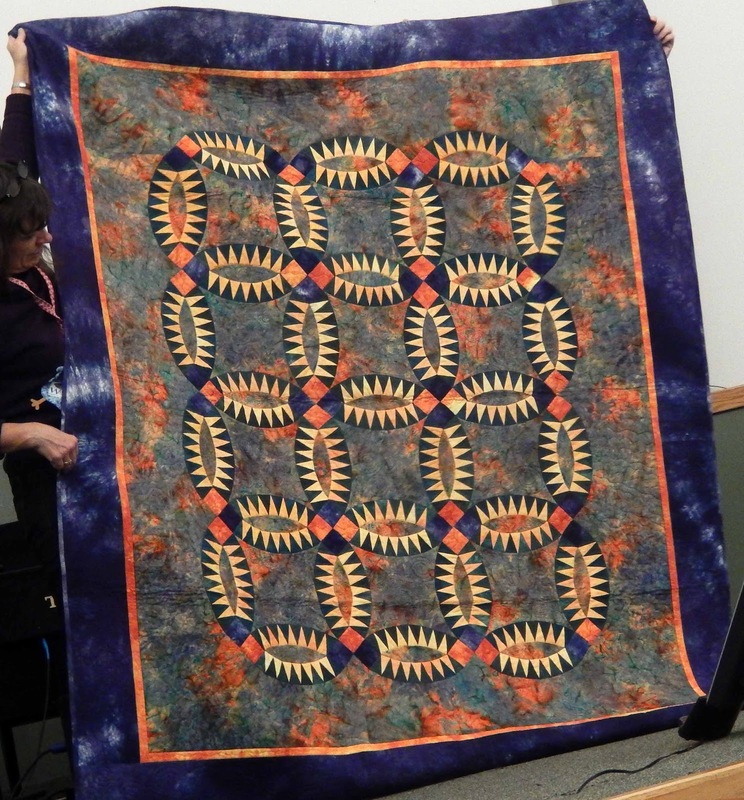 and its quilting also reflects its origin. 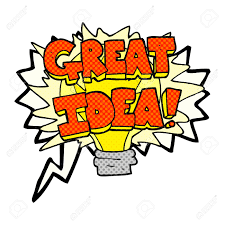 Here's a nod to the creative process. 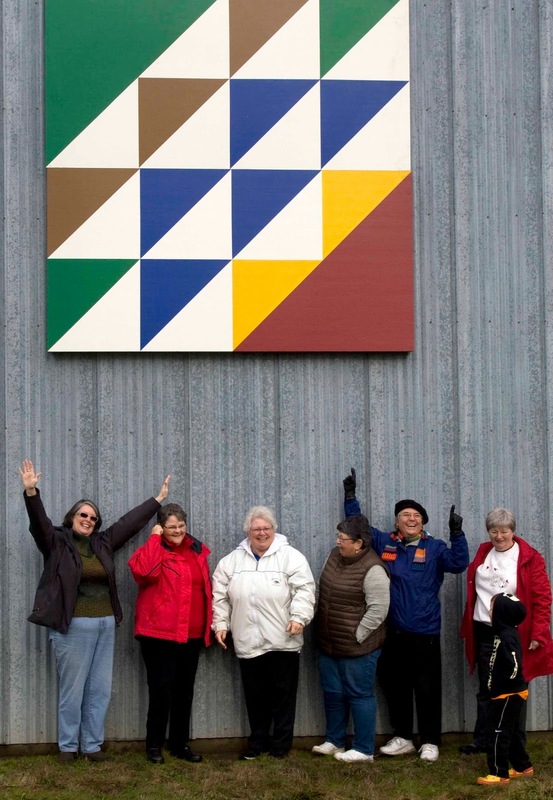 If you would like to learn from Sam Hunter, she will be teaching a class on her "Dingbats" pattern (below) for guild members in April.